While out taking a stroll along the streets of Harajuku one early evening, we came across these two moms and their adorable daughters, who are all dressed in eye-catching streetwear. At the left is Shizuko and her daughter, Misaki. 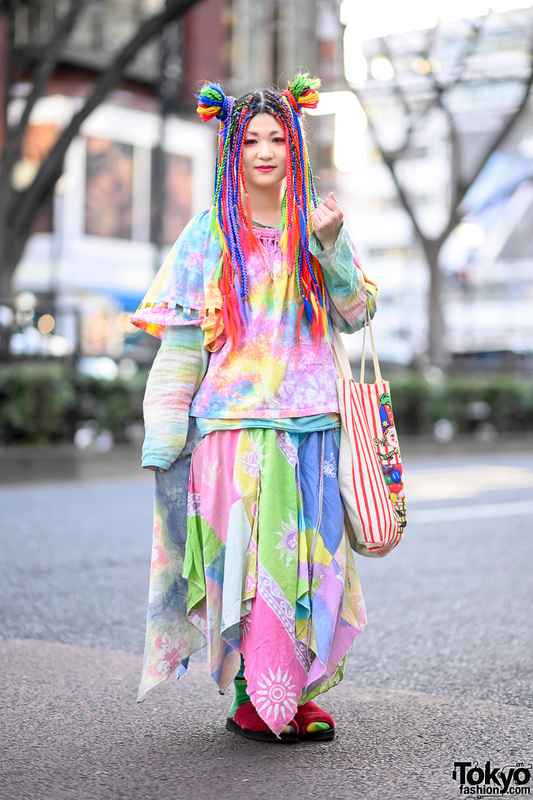 Shizuko is dressed in an all black ensemble from Franky Grow, consisting of a patterned tunic top over a sweatshirt, a sheer tiered skirt worn over matching patterned pants, black-and-white socks, and a pair of white lace-up shoes from Louis Vuitton. She accessorized with a black ribbed hat, statement earrings, a silver pendant necklace and a monochrome statement bib necklace, multiple bracelets, a black sling bag with badges, and a Balenciaga tote bag, some from Kouitten and Foure. 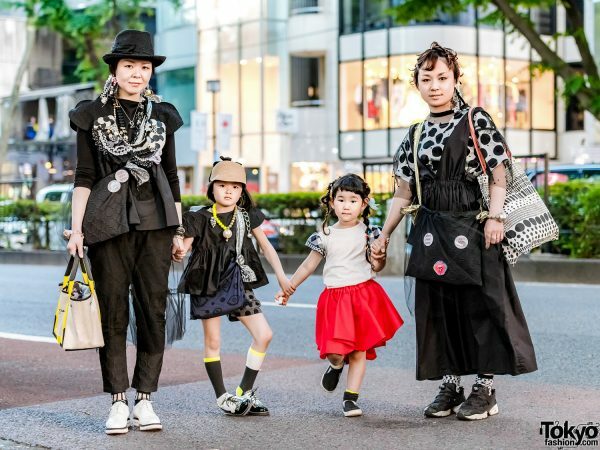 Meanwhile, 5-year-old Misaki is also dressed in a matching Franky Grow outfit, with a patterned tunic top, polka dot shorts, colorblock socks, and black-and-white lace-up shoes, also from Louis Vuitton. A tan hat with a black bow, a statement beaded necklace, and a printed Arere tote bag rounded out her cute outfit. Shizuko and Misaki’s favorite brands are Louis Vuitton and Franky Grow. Follow the adventures of the adorable Misaki on Instagram. Meanwhile, at the right is Sayaka and 4-year-old Aruyu. Sayaka is wearing a polka dot top from Uniqlo, worn underneath a black Bulle De Savon ruched dress, and styled with a tulle top from Urban Research. She slipped into polka dot socks, Reebok sneakers, a polka dot tote bag and a patterned sling bag from Arere. Accessories from Kouitten include a printed hair tie and a gold beaded bracelet completed her look. Meanwhile, Aruyu is dressed in white shirt from Franky Grow, a handmade red skirt, black and yellow socks, and black loafers. Cute and colorful hair clips finished off her cute ensemble. Franky Grow is their favorite brand, and they like the music of Kenji Ozawa and Mr. Children. Follow Aruyu’s adorable feed on Instagram.